From its diverse, multicultural environment, to its internationally recognized, innovative programs, IE University is a sure bet for a well-rounded and prestigious education. It could be your desire to explore and experience a new country that brings you to IEU. It could even be a way to get to know yourself a little better. But how could studying in a small town in the Castilian Plains become one of the most satisfactory university experiences in the world? A good story is nothing without the proper setting. As another of our alumni, Teymour Benet, says, “studying in Segovia offers the peace and versatility of living in a small city that’s in the countryside, but at the same time a short distance from Madrid. However, sometimes the vast possibilities that come with studying in such a unique setting aren’t so obvious, especially when you’re new to the campus and anxious to become part of the community. That’s why today, we’re launching “Things to do at IEU”: a massive effort, joining current students, alumni, and Student Life staff from IEU Segovia, to help both current and future students learn more about this enchanting city, and discover new ways to get involved in campus life in Segovia. In “Things to do at IEU,” we will showcase various plans and activities that our students and alumni have deemed unique to IEU’s university experience, ranging from the best tapas bars to beautiful hidden spots around the city and IEU’s campus. We hope that these plans will serve as an inspiration to get out and explore Segovia. 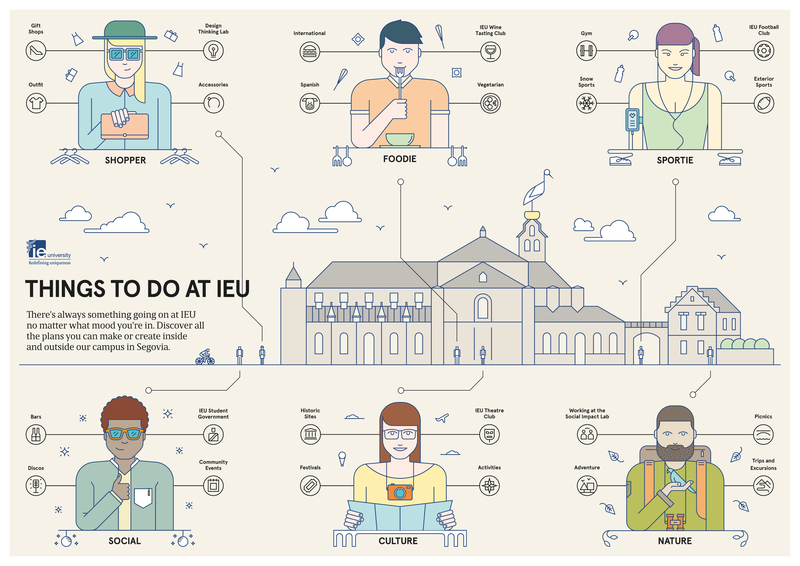 Depending on what mood you’re in, you will be able to find various plans and activities posted on this blog in our “Things to do at IEU” guide. Feeling active? Check out the Sporty mood. Craving something tasty? You will find the best tapas bars and restaurants under the Foodie section. Want to learn more about Segovia? Visit one of the cultural attractions in the Culture section. We also have something for shoppers, nature-lovers, and social butterflies! Stay tuned for new content full of plans and recommendations from our students, alumni, and staff right here at #GoingToIEU! Learn more about our undergraduate degrees Learn more!